Alex Brizer ’19, speaking about his experiences of disarmament education at the 2018 Mortola Society luncheon at Pace University. 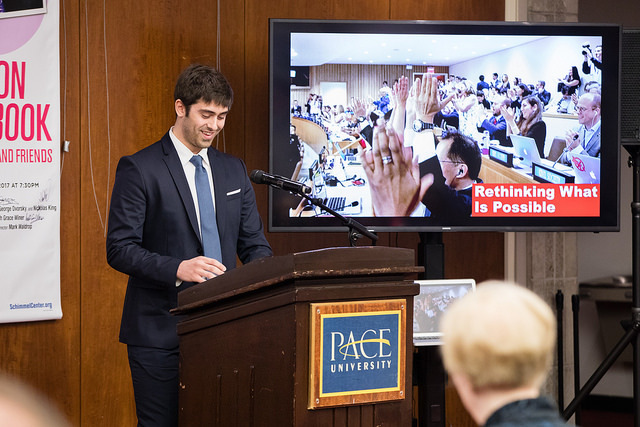 The following reflection is a speech that Alex Brizer ’19 delivered to the Mortola Society luncheon, celebrating donors to Pace University on 19 April 2018, reflecting on his experiences in the POL297L Global Politics of Disarmament and Arms Control class in Fall 2016. Good morning everyone! Thank you for inviting me to speak today at the Mortola Society luncheon. My name is Alex Brizer. I’m a student here at Pace University, at the New York City campus, majoring in Communications and minoring in both History and Criminal Justice. In the fall of 2016 I signed up for what seemed like an interesting class called “Global Politics of Disarmament,” not knowing a thing about the topic or professor, Dr. Matthew Bolton. What transpired over the next few months was undoubtedly the most meaningful and by far best experience I have had at this University.